Well if you don’t factor in the true cost, the Benefit allways WIN’S!!! Benazir Bhutto thought so in this interview with David Frost. Bhutto told Frost who she believed killed Bin Laden and For some reason Frost completely ignores what she said. This Interview took place on november 02, 2007, before her death On December 27, 2007. Benazir Bhutto was of course killed by terrorists. 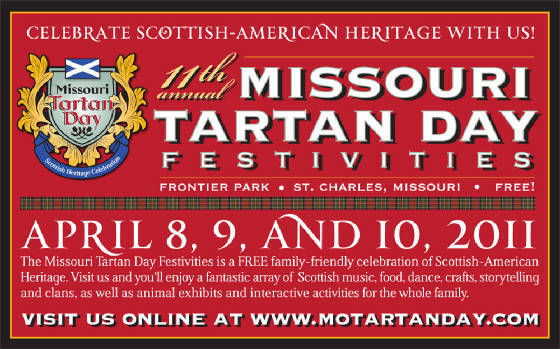 Happy Tartan Day, April 6,1320. Scottish Declaration of Independence. Scotland expelled the English armies under Edward II with its victory at Bannockburn in 1314 and with the recapture of Berwickin 1319. However, the English did not give up and mounted countless attacks into Robert the Bruce’s Scotland. The Pope had not accepted Scottish independence, perhaps partially because Robert the Bruce had been excommunicated for killing John Comyn in a church in Dumfries in 1306. 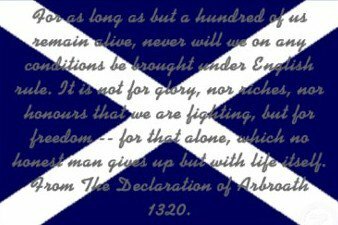 Thus the Declaration of Arbroath was prepared as a formal Declaration of Independence. It was drawn up in Arbroath Abbey on the 6th April 1320, most likely by the Abbot, Bernard de Linton, who was also the Chancellor of Scotland. The Declaration urged the Pope to deny the English claim on Scotland. Secondly, the manifesto affirmed the nation’s independence in a way no battle could, and justified it with a truth that is beyond nation and race. Man has a right to freedom and a duty to defend it with his life. The original, delivered to the Pope in Avignon is lost, but was acknowledged on 28th August 1320. The Pope wrote to Edward II urging him to make peace, although it was not until 1324 that the Pope addressed Robert Bruce as King. Finally, in 1328, Edward III formally recognized King Robert’s title and the independence of Scotland. …Yet if he should give up what he has begun, and agree to make us or our kingdom subject to the King of England or the English, we should exert ourselves at once to drive him out as our enemy and a subverter of his own rights and ours, and make some other man who was well able to defend us our King; for, as long as but a hundred of us remain alive, never will we on any conditions be brought under English rule. It is in truth not for glory, nor riches, nor honours that we are fighting, but for freedom — for that alone, which no honest man gives up but with life itself. …May it please you to admonish and exhort the King of the English, who ought to be satisfied with what belongs to him since England used once to be enough for seven kings or more, to leave us Scots in peace, who live in this poor little Scotland, beyond which there is no dwelling-place at all, and covet nothing but our own. We are sincerely willing to do anything for him, having regard to our condition, that we can, to win peace for ourselves. Moment of Humor, I hope you laugh as much as I did. Eric Holder Blames Congress, Has to reverse himself.